LAS VEGAS, March 26, 2019 /PRNewswire/ -- AGS (NYSE: AGS) (or the "Company") today announced that it will be exhibiting at NIGA's Indian Gaming Trade Show April 3-4 in San Diego, with a spotlight on the Company's newest core slot cabinet – the Orion Upright℠ – along with a host of new slot titles, table products, and online social and real-money gaming solutions. AGS will be live in Booth No. 1651 at the San Diego Convention Center. Taking center stage will be AGS' new Orion Upright, a core cabinet with many of the same features as the Company's award-winning Orion Portrait℠ and Orion Slant℠ platforms, including the distinctive starwall design featuring 420 game-synchronized full-color LED lights to celebrate gameplay. The Orion Upright is launching with a library of exclusive new titles and greatest hits from AGS' ICON™ cabinet. Debuting for the first time at NIGA, gaming operators will experience AGS' Orion Upright with the new Fortune Blast™ family featuring four brand-new titles — Luck and Luxury™, Imperial Luck®, Goddess Treasures®, and Blazing Luck™. This new series offers ways or line-pay evaluation for more winning opportunities, and a symbol-locking feature to keep players on the edge of their seats. AGS President and Chief Executive Officer David Lopez said, "NIGA is a show we look forward to every year because it gives us a chance to meet with our tribal operator-partners in an intimate setting and highlight our newest and most exciting products that are launching over the year. This year we are very excited about our new Orion Upright because it fills a need on many casino floors for a differentiated, attractive, and sophisticated core cabinet with great content." The Company will also showcase its hottest new Class II and Class III titles for the Orion Portrait platform, including Crystal Magic®, Hearts and Horns™, Enchanted Pearl™, and the popular Rakin' Bacon!™ with its cherubic pig that gets fatter and fatter as the wins add up. Hailing from the Company's Australia game-development studio, the title Red Silk™ showcases a fresh new family on Orion Portrait featuring a three-level linked progressive, a wild reel feature, and up to 10 free games. For the Orion Slant, AGS will spotlight the Fa Cai Shu™ and Kingdom Ca$h® families, which offer themed banking, linked progressive jackpots, and a variety of math models for a diverse and exciting gaming experience. AGS continues to propel its table products business with a host of new proprietary table games and table solutions. NIGA attendees will get to experience Super Start Hold'em™, a poker-style game whereby the players always start with the better two-card hand than the dealer; the popular Criss Cross Poker™ with Bonus Spin™; Blackjack Match Progressive™ featuring the popular must-hit-by jackpot level; and Three Card Blitz, an exciting new flush-based game featuring player vs. dealer excitement to achieve the highest-scoring hand using up to three suited cards. In the Company's Interactive display, AGS will showcase its ConnexSys™ Social White-Label Casino solution, a turnkey, free-to-play mobile casino app that integrates the casino brand with AGS' proven and player-favorite land-based titles to keep players engaged at home, work, and on-the-go. 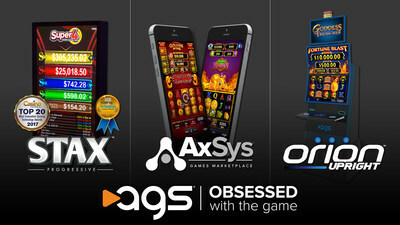 And with real-money gaming at the forefront of many tribal gaming operators' agendas, AGS will also be on hand to provide live demonstrations of its AxSys Games Marketplace™ and large library of titles, featuring AGS top-performing games as well as a host of entertaining games from third-party developers.